Keep your yellow jacket traps working effectively with Victor Poison-Free Yellow Jacket Bait. Open a bait packet and mix it with 1/2 to 1/3 of a cup of water. 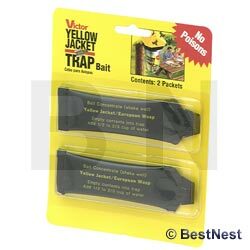 Place the solution in the Victor Poison-Free Reusable Yellow Jacket Trap to keep it working at its best. Use the Poison-Free Yellow Jacket Bait to keep bees from buzzing around your yard. Made in the USA.